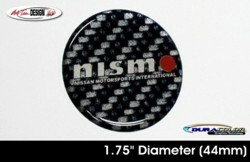 Enhance your vehicle with this NISMO Simulated Carbon Fiber "domed" decal. "Domed" decals are not just vinyl decals. They are a tactile, three (3) dimensional decal that look like a factory manufactured emblem. It's very easy to install and includes easy-to-follow general online instructions.